J and I are on our own again, and here’s where the story really gets interesting. Not that China wasn’t interesting before…it’s just that we’re now no longer on the 5-star hotel circuit. ‘Nuff said, right? Our next destination was Yangshuo, a town near the city of Guilin in Guangxi province, famous for its karst topography. By the way, if you didn’t know, “karst” means “limestone formations.” Jeremy hates this word…he thinks it sounds ugly and abrupt, which is contrary to the word’s meaning. In fact, the karsts are quite beautiful…huge mounds of rock jutting out from the land, like some giant underneath the earth was playing Whack-A-Mole. 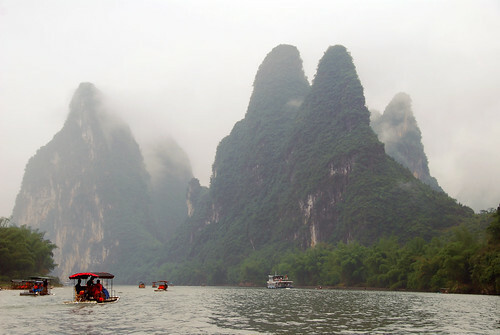 Yangshuo is very similar to Halong Bay in Vietnam, except that Yangshuo is on land, whereas Halong Bay was in the water. Thus far, we’ve only seen this country as part of a tour group, which, quite frankly, is a good way to ease into the chaos that is the People’s Republic of China, especially when you are coming from an orderly, polite, and developed society like Taiwan. We’ve been insulated from much of the logistics of traveling, like figuring out how to get from point A to point B, negotiating with locals trying to sell you tours or various means of transport, or trying to figure out what is OK to eat when you can only read about 35% of the menu. We’ve also had very little contact with Westerners (besides the ones on the tour), since most of the places that we went with my parents were sites on the local—not international—tourist route. So imagine our surprise when we arrived in Yangshuo and saw wai guo ren’s all over the place! We were gawking at them like the locals gawk at Jeremy…in retrospect it would have been really funny to ask them to take a picture with us (funny to us, they probably wouldn’t find it too amusing). 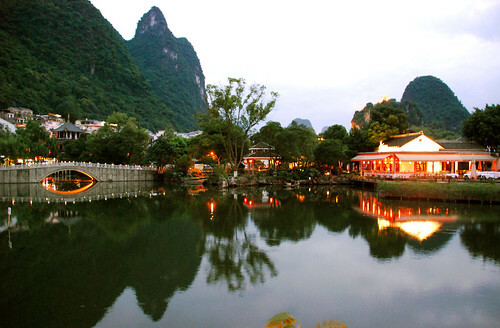 Yangshuo is very much a tourist town on the Western backpacking circuit, but it is very pleasant nonetheless. 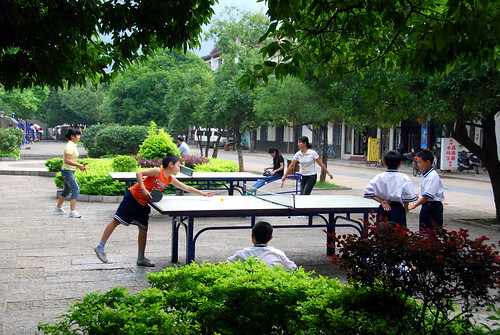 You can see school kids playing ping-pong at tables set up along the Li River (which borders the busiest part of town). Our hotel room had a view of a manmade pond where a local fisherman “fished” (I am pretty sure this was just a performance for the tourists) with his cormorants (large pelican-like birds that try to swallow the fish; a ring around their neck prevents them from doing so…allowing the fisherman to extract the fish from the cormorants’ mouths). 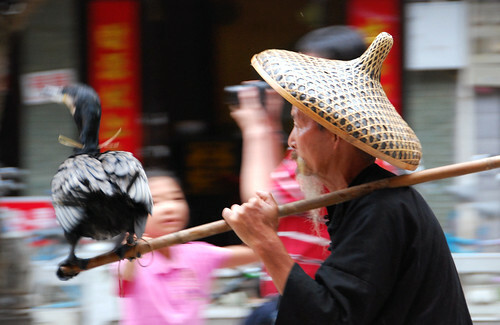 Local fisherman walking through town with his cormorant. At night, the main street through town (West Street) becomes a night market, full of the usual trinkets (cell phone charms, fans, fake jade bracelets, backscratchers, etc.) aimed at the tourists. 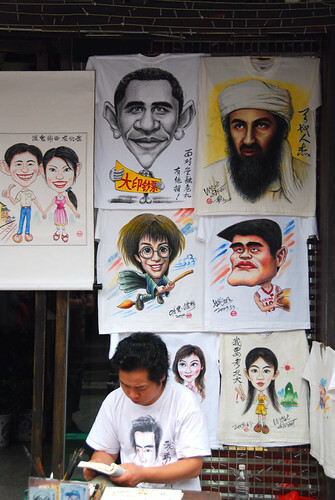 One weird thing we saw for sale were these airbrushed caricature t-shirts of Osama bin Laden next to Yao Ming and Obama…apparently some people in China do not consider Osama in Laden to be “bad,” they see him as a rebel, with the accompanying idolization. Buy your t-shirt of Obama, Harry Potter, Yao Ming, or…Osama bin Laden? But most people do not come to Yangshuo to shop in town; it’s the karsts that are the star of the show. So we headed for Xing Ping, a smaller town a little ways up the Li River, where you can take a bamboo raft down through all those beautiful limestone molehills. Perhaps our first indication that the day was not on our side was the weather: it was misty and drizzly that day, making our boat ride cold and wet, not to mention unscenic (the fog was too heavy that day for us to see much, though it did add a touch of drama to the events to come). As soon as we stepped off the bus in Xing Ping, we were accosted by many touts (all women) trying to sell us a bamboo raft ride. As the walk to the pier was quite long, I struck up a conversation with one and we agreed on a price: 100 RMB (about US$15) for the ride. I tried to get her down to 90 RMB, but she then came up with a mythical “park entry fee” of 10 RMB each. If we agreed to pay 100 RMB, she would pay the park entry fee; if we wanted to pay 90 RMB for the ride, the entry fee was our responsibility. Our negotiation was quite genial, and we were laughing and joking as we walked. We settled on 100 RMB, and she and the other two ladies who were walking with us stopped to throw three wads of paper on the ground; whoever picked up the correct piece of paper would get the sale. 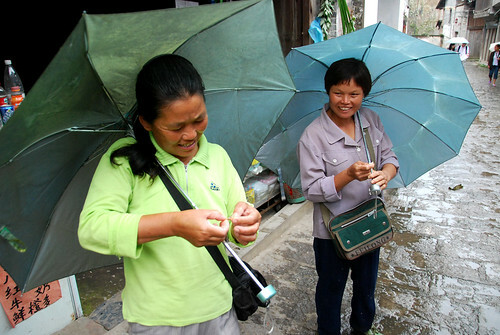 Two of the tout ladies in Xing Ping checking their wad of paper to see who won the sale. Though we had negotiated with the woman on the left, the woman on the right won the sale, and she showed us to the pier, where her husband was waiting with his bamboo raft. When we arrived at the pier, another Chinese couple, who had been on the bus to Xing Ping with us, approached us about sharing their boat for only 60 RMB per couple. Our bamboo raft lady was furious, and we felt that we had given her our word, so we told the couple that we couldn’t join them on their boat. We got on the boat and paid our 100 RMB. Two minutes after we had sailed off, the lady calls her husband and tells him that we forgot to give our extra 20 RMB “park fee.” I couldn’t believe it…we were being scammed! And by my own peoples! Now it was MY turn to be furious…not only was she increasing the price on us, but had we turned down a better deal with the bus couple to stay faithful to her! Needless to say, the ride down the river was not pleasant or interesting…the old bamboo raft man pointed out not a single point of interest (he even neglected to mention when we arrived at the “20 RMB spot”—on the back of the 20 RMB note, there is an image of Yangshuo…and yes, the irony of the fact that we were disputing over 20 RMB was not lost on us). After a cold, wet, and uneventful raft ride, we got back to the pier, where we planned to leave without paying the 20 RMB…after I took down the man’s name (he wrote a fake name, I am sure). He followed us along the road, yelling and screaming about his 20 RMB. Finally, having had enough of this drama, I took out 20 RMB, threw it on the ground, and yelled at him in Chinese “YOU THROW AWAY YOUR FACE!” (the equivalent of “You should be ashamed of yourself!”), causing a huge scene in front of a bunch of other tourists. I realize that 20 RMB is not a big deal, but it was the principle of the matter! Later on, we asked a couple of locals to identify the woman in the photo above so that we could report her to the local tourist office, but nobody would tell us her name. By now, my opinion of Xing Ping had been sealed…I did not like this place. 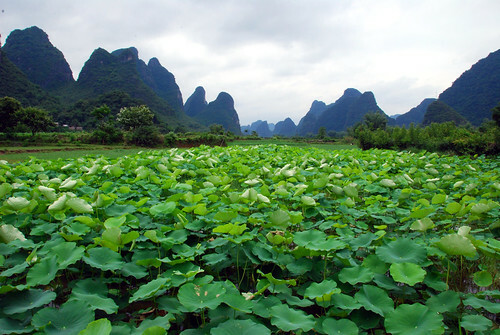 Lily pond in front of Yangshuo’s karst scenery. 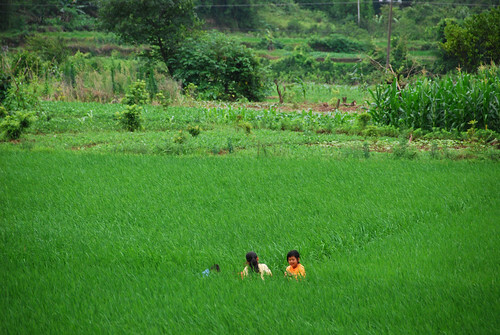 Kids playing in rice fields. Totally random—at a park built around a 1000-year old Banyan tree, tourists can take photos with monkeys in costumes. We felt terrible for them, as they were clearly confused and terrified. Us, at the top of Moon Hill, so named for the perfect circle (like a full moon) in the center of the rock. We had a nice day in Yangshuo—one might even say it was a beautiful day, but I still had the bad taste of the previous day’s scam in the back of my mouth. A couple of life lessons we learned from this experience: (1) where there are Westerners in China, there are scams, and (2) just because something is beautiful on the outside, doesn’t mean it is the same on the inside. In the big scheme of things, 20 RMB was a very small price to pay to learn these lessons. But for me, Yangshuo had thrown away it’s face, and though there was much more to see in the greater Guilin area, we scurried out of there as fast as we could, eager to get the bad taste of Yangshuo out of our mouths. Todd and I had a similar experience in Tiger Leaping Gorge. Negotiation. Hand off to another guide. New charge. Getting screamed at in Chinese. I lost my cool when the angry old man asking us for 10 RMB grabbed my arm, nearly knocking me over on a rock over the raging river. 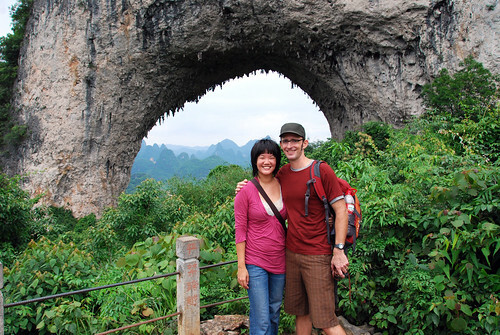 Sorry to hear that your experience tainted your Yangshuo experience. What kept me sane was saying to myself “They can only take my money if I hand it to them.” After that, anyone could scream about money all they wanted, I just kept walking and made sure to talk to Todd about something more pleasant. The greedy do give up…eventually!